These SuperHero Girls Gel Pens contain four assorted coloured pens. Each with a printed design featuring characters from the popular DC Kids Franchise. Includes Super Girl, Batgirl Hero, Wonder Woman and Star Sapphire from SuperHero High School. Super Hero High is the place for young Super Heroes to find that acceptance while they're being taught to hone their unique Super Powers. 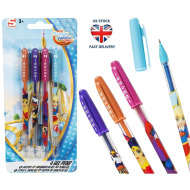 Perfect for home or school for colouring and writing fun. These SuperHero Girls Gel Pens contain four assorted coloured pens. Each with a printed design featuring characters from the popular DC Kids Franchise. Includes Super Girl, Batgirl Hero, Wonder Woman and Star Sapphire from SuperHero High School. Super Hero High is the place for young Super Heroes to find that acceptance while they're being taught to hone their unique Super Powers. Perfect for home or school for colouring and writing fun.